Free Printable First Day of Second Grade Sign. Download Free Printable First Day of Second Grade Sign for you kids the 1st day of school. I just wanted to do first day of school signs for my kids that start Kindergarten and Fifth Grade respectively and searched for some ideas browsing internet. This was my first time making this type of sign and considering I am a novice user I think the result is not bad at all. I ended up making from Preschool to Twelfth Grade and decided to share with you. If you like this practice design you can use it to start school this August or September with a nice photo. Use a 8.5 x 11 photo frame or trim it to fit on a 8 x 10. 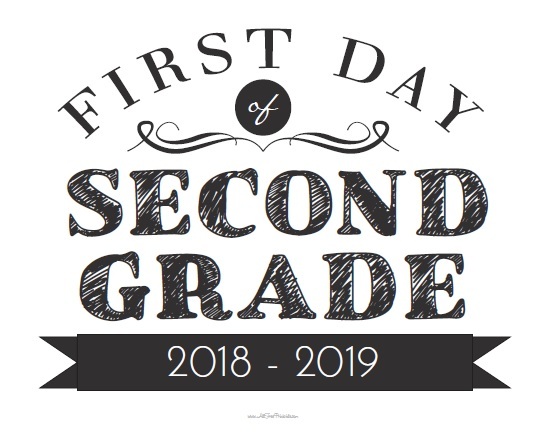 Download Free Printable First Day of 2nd Grade Sign.